Take one of the world’s best road trips, travelling on the 9 Day Perth to Adelaide Tour across the vast plains of the Nullabor and beyond. This 9-day adventure exposes you to the incredible natural beauty of the region, taking in once-in-a-lifetime wildlife encounters, ancient landscapes, and stunning coastal scenery. At night, you’ll sleep under the southern stars for an extra kick of adventure. Sale prices for departures in May! 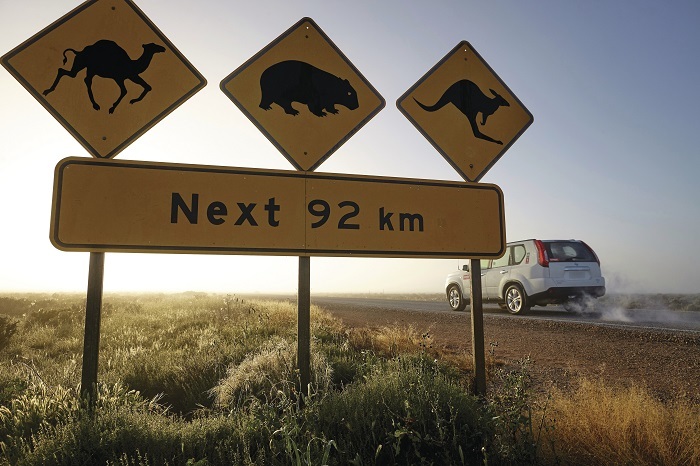 Combine Australia’s ultimate road trip with incredible wildlife encounters on our 9 Day Perth to Adelaide tour. 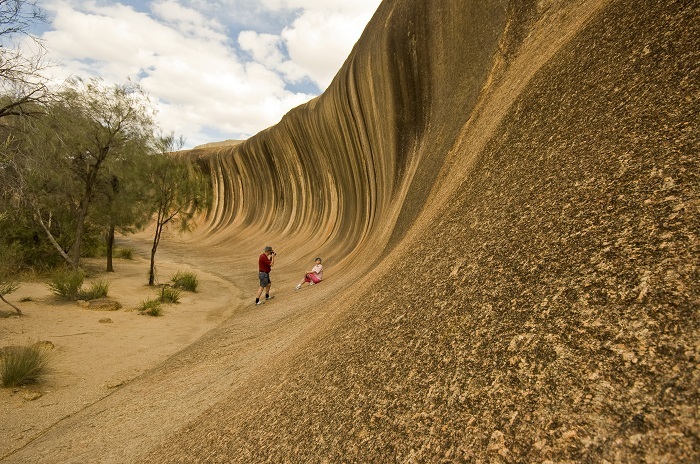 This tour includes traveling across the vast plains of the Nullarbor, showcasing you the true Australian outback. There are also plenty of great optional activities offering close interaction with aquatic wildlife. Take in the sight of the stars as you sleep comfortably in your swags as the sun goes down! We depart early from Perth and journey east over the Darling Ranges, stopping in Western Australia’s oldest inland town, York, for a coffee. Continuing east we arrive at the unique Wave Rock, where we will enjoy our first lunch break. By the afternoon, the we reach the internationally recognised Fitzgerald River National Park for our first night of swag camping on the Perth to Adelaide Tour. We begin day two with a morning hike up East Mt Baron before we travel into Esperance to enjoy a coffee and a look around the stunning seaside town. We then continue on to the spectacular scenery and stunning beaches of Cape Le Grand National Park. Even the local kangaroos can often be found lazing about on the snow white sand of Lucky Bay. The rest of the day is in your hands, with the option to adventure on a bushwalk, swim in the crystal clear ocean waters, take photos of the magical landscapes or mingle with fellow participants on the trip. Early on day three will be the prime time to go kangaroo spotting if you missed them the previous day. An early morning hike up the stunning Frenchmen’s Peak will give you unparalleled views of the beaches and islands of the Recherche Archipelago. Our journey continues towards the historical town of Norseman for lunch, then east on the Eyre Highway. Our bush camp for the night gives you the ultimate IMAX version of the great southern night sky. This display of shooting stars and constellations will leave you amazed! Get ready to be amazed by the sheer size of this vast country as we journey 500 kilometres on the world’s longest stretch of road and enter the state of South Australia. The Nullarbor gets its name from the Latin word meaning “no tree”, so don’t expect you to see a whole lot of vegetation on this part of the journey. On the way, we stop at the old township of Eucla, before spending the night camping at Koonalda Homestead. Driving continues on day 5 of the tour as we visit many famous sites along the way. Stop for a photo of the highway’s famous ‘Camels/Kangaroos/Wombats Cross road sign. View where the Nullabor Plain meets the Southern Ocean at the impressive Bunda Cliffs. As we cross the Dingo Fence, the world’s longest fence, we will enter the Yalata Aboriginal Lands. In the afternoon, we will have the opportunity to learn about Indigenous artwork at the Ceduna Arts and Cultural Centre. We stop at Streaky Bay to stock up supplies, before arriving at Coodlie Park bush camp. This working farm will give you an insight into the challenges of life on an Aussie farm and has it’s very own private beach. Today you will have the opportunity to get up-close and personal with some of Australia’s friendliest sea life in the fishing village of Baird Bay. 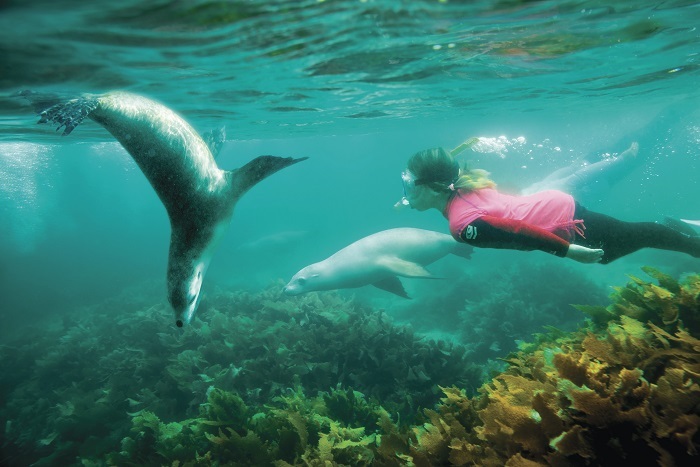 The clear Southern Ocean waters off the Eyre Peninsula are home to delightful dolphins and playful sea lions. You can jump in the water and join these good-natured mammals for the most exciting swim of your life. ($180 own expense – please mention at the time of booking if you would like to add this option). Alternatively, you spend the morning back on land and relax at your own leisure. After a delicious lunch on the beach, we make our way to Sceale Bay Surf School to learn to surf on a remote and pristine beach! For those who want to stay dry, simply relax and enjoy the stunning scenery around you or explore Sceale Bay, before heading back for the night at Coodlie Park. Day seven starts off with some exhilarating sandboarding at the Lake Newland Sand Dunes, then it’s off to explore the famous Eyre Peninsula. We’ll make a with a pit stop at Talia Cave before arriving to the Seafood Capital of Australia, Port Lincoln for some delicious lunch. We will have free time to explore the area before arriving to our campsite in Mikkira, known for being a working sheep station and its surrounding of Manna Gum Trees. Day eight tests the fears of participation on the tour, as those who dare will have the opportunity to swim with the Great White Shark. You will take a cruise into the ocean where you can get suited up into diving gear and view these impressive and frightening creatures from the safety of a cage (own expense – please mention at the time of the booking if you would like to add this option). 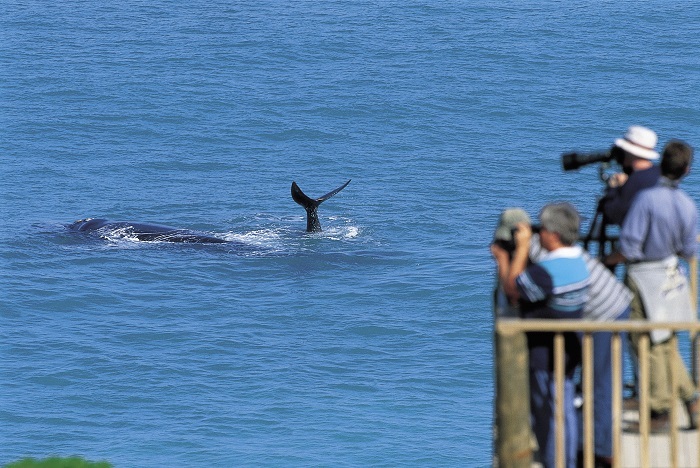 For those who are not keen on getting in the water with one of the world’s deadliest sea creatures, you may decide to visit Lincoln National Park to view some of the most stunning coastline scenery of South Australia. We’ll continue our adventure along the coastal line to get a glimpse of some of Australia’s oldest rock and maybe if we’re lucky we may even get a chance to spot some iconic wildlife animals like the kangaroos and emus! We’ll stop at Wadlata Cultural Centre, where we will enjoy a leisurely stroll amongst the life of the new frontier pioneers of South Australia. Followed by this, we’ll meet up again to journey to our campsite in Mt. Remarkable National Park. 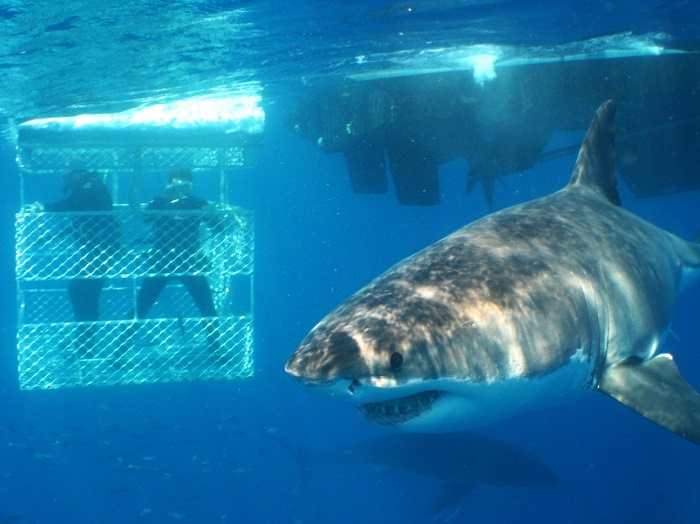 Optional activity: Shark Cage Dive tour to the Neptune Islands for an up close encounter with the Great White Shark – $395 + $125 water entry fee payable on the day. 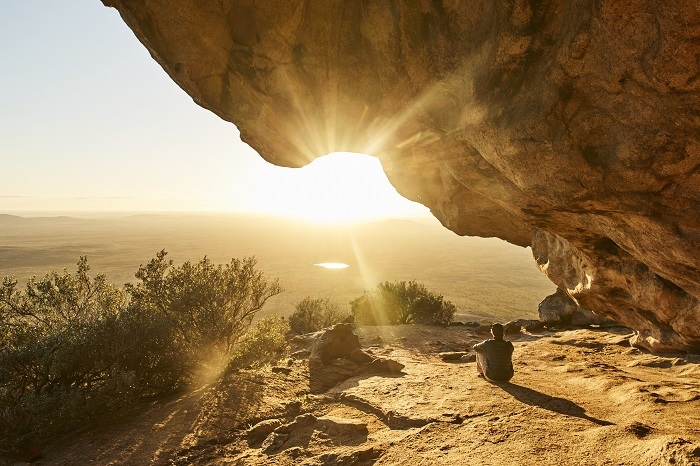 On our last day of our 9 Day Perth to Adelaide Tour, we’ll embark on our last hike to Davey’s Gully Walk and take in the spectacular views from Mt Remarkable National Park, before arriving into our final stop, Adelaide. 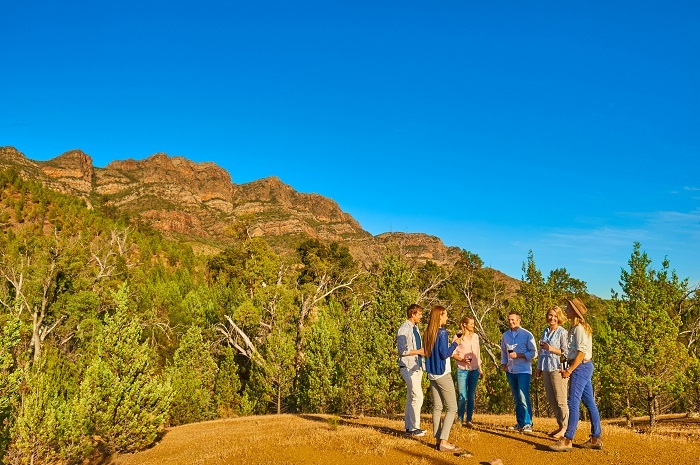 The conclusion of the tour is a great time to reflect on your adventure with your fellow Perth to Adelaide Tour group members.